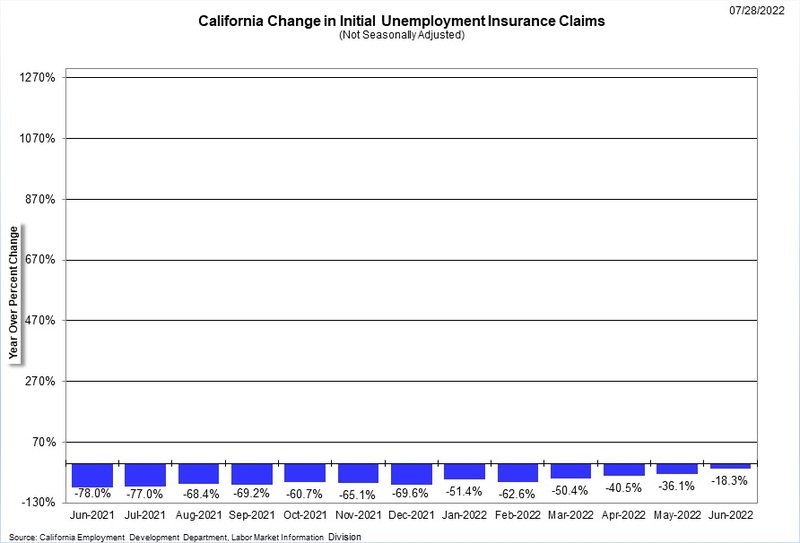 The Unemployment Insurance (UI) monthly claims data are used in current economic analysis of unemployment trends in the Nation and in each State. Initial claims measure emerging unemployment and weeks paid measure the duration and severity of unemployment. UI Claims Data are available from the US Department of Labor Web site. Weekly data are available from 1987 to present (not seasonally adjusted) and monthly from 1971 to present (not seasonally adjusted). Data do not include special UI programs. Unemployment Rates and Labor Force for California and Los Angeles are available from 1976 to present (seasonally adjusted and not seasonally adjusted) and all other areas from 1990 to present (not seasonally adjusted). 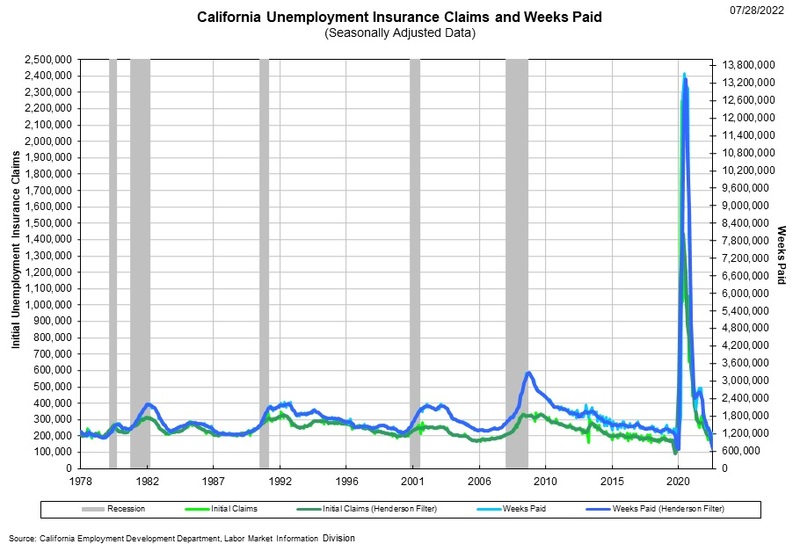 Click here to download seasonally adjusted data for California UI claims, 1978 to present. 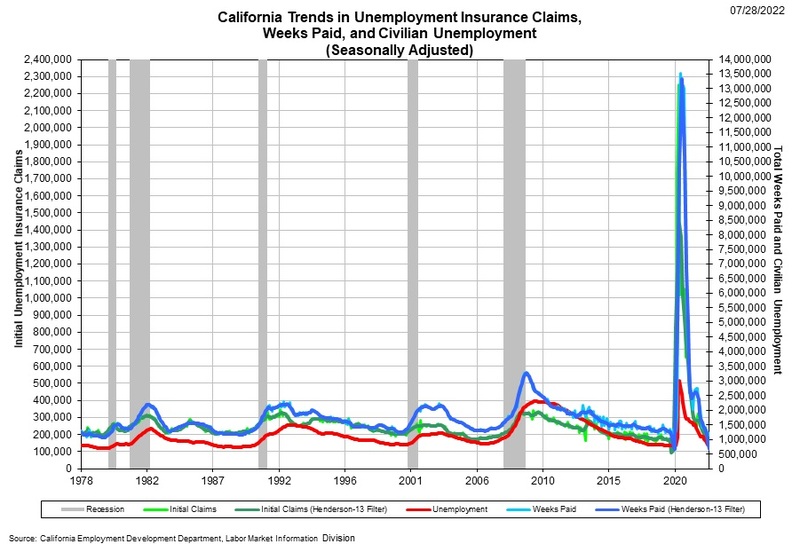 In February 2019, 166,184 initial unemployment insurance claims were filed and 1,370,303 total weeks paid in California. Adjusting for seasonality 170,474 initial claims were filed and 1,360,645 weeks paid. Initial claims decreased 29,231 (14.6 percent) and weeks paid were up 63,944 (4.9 percent) in February, both seasonally adjusted. Initial claims increased 10,957 (7.1 percent) and weeks paid were down 32,779 (2.3 percent) from February 2018. Note: Year over changes are measured using not seasonally adjusted data since comparing the same month the previous year is not subject to seasonal patterns. Seasonally adjusted, initial claims were down over the month 29,231 (14.6 percent) while initial claims were up 10,957 (7.1 percent) over the year. The February year over increase was the 8th in the past 55 months since August 2014. Since the January 2010 recession, initial claims have decreased by 209,611 or (55.8 percent). Weeks paid increased by 63,944 (4.9 percent) over the month and decreased 32,779 (2.3 percent) since February 2018. The February 2019 year over decrease was the 49th decrease in the past 58 months. Weeks paid are down over 1.7 million or (56.1 percent) since high of 3,119,065 in March 2010. The following charts are updated monthly using the most recent data available from the above sources. This chart illustrates a comparison of initial unemployment insurance claims and number of weeks paid from January 1978. For the purpose of this chart, data have been seasonally adjusted by the Labor Market Information Division (using the x12 software provided by the Census Bureau) and a Henderson-13 trend filter is used to smooth data. This chart illustrates a comparison of initial unemployment insurance claims, number of weeks paid, and the number of unemployed persons. For the purpose of this chart, both initial unemployment insurance claims and weeks paid have been seasonally adjusted by the Labor Market Information Division (using the x12 software provided by the Census Bureau) and a Henderson-13 trend filter has been used to smooth data. Unemployed persons is measured monthly and seasonally adjusted by the Bureau of Labor Statistics as part of the Local Area Unemployment Statistics program. Note: Seasonal factors have been updated for the entire series beginning with the January 2012 data release.